Shakespeare & Company's 2018 season features “Love's Labor's Lost,” “As You Like It,” and “Macbeth.” How will these plays be presented? Often scripts are cut or altered to "two hours traffic" upon the stage. Since most modern productions of Shakespeare will be cut, the question now becomes not whether to cut, but where, how, and why to cut. Cutting, altering and transposing scenes must be done judiciously so that the audience can follow the story line and make sense of the dialogue. The Company's track record has proven its ability in making the dialogue clear while achieving dynamic, entertaining performances. Cutting may keep a performance successful by not just cutting actors' roles but by having the same actor play multiple roles, or minimizing props, or altering historical periods through costumes. Such cuts serve to underscore thematic significance or to symbolize meaning. For instance the 2004 production of “As You Like It” presented a multiple of motifs, two being nurture vs. nature and good vs. evil. The Duke brothers, Frederick and Senior, played by one actor, symbolized the dual nature of man in his ability to encompass his darker nature and his better self. Costuming promoted this concept. When at court, men's costumes were black whereas in Arden they became white. Touchstone, the fool, wore a black and white Harlequin pattern jumpsuit, suggesting that he, unlike the men of the court, had the ability to balance the light and dark side of his humanity. “Love's Labor's Lost” presents a challenge. This comedy is a feast of language with witty puns of topical references and archaic words. 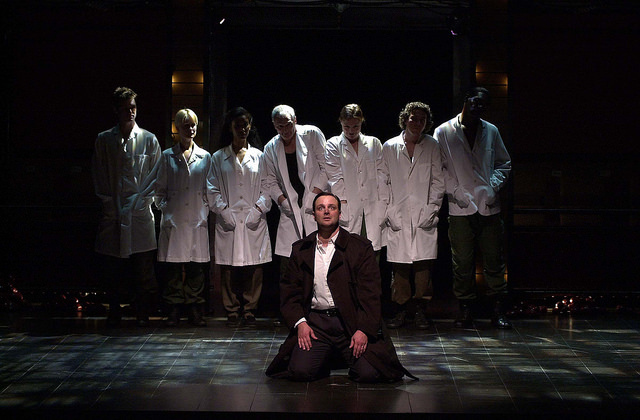 Shakespeare & Company's 1999 production also became a feast for the eyes and ears, employing devices to portray character and especially interpret and enliven lines. Wordplay was often translated through "sight" play: ropes as swings, masks to signify deceit, shadow puppets, and swordplay. Miming, dancing, singing, and swinging often accompanied dialogue. These devices added to the audience's understanding of archaic words, allusions, and complex puns, plus made long speeches entertaining. galvanized tub used for Duncan's bath, the witches' cauldron, the washing vessel for Lady Macbeth's hands, and the weapon to murder Lady Macduff. A hospital gurney served as the banquet table, a morgue slab for Banquo's body, and a bed where nightly dreams shake Macbeth. When Shakespeare & Company cut, how do they make certain not to sacrifice all Shakespeare's powerful poetry? First, the words need to make sense and come alive to the actor. Consequently, directors and actors work closely with meaning, meter, and word emphasis. The 2002 production of Macbeth was situated in a post September 11 world. The audience was plunged into a hectic era of modern warfare: soldiers in army fatigue and red berets, secret service men in sunglasses, reporters in trench coats with tape recorders. Yet, eight actors played 42 roles. The tyrant in the modem world evidently has more need of technology than magic. Act IV presented the witches as scientists in white coats in their experimental lab clutching clipboards and referring to notes as they chanted "Double, Double..."
Further effects of this techno-world are blared with media reports from radio and TV. Sounds and floodlights bombard the audience as Macbeth gave his inauguration speech. Despite all the special effects, the production still made the language clear. The visual and aural effects did not replace the text as much as reinforce a contemporary interpretation. Shakespeare & Company's cutting and alterations have been successful in keeping the language understandable for a contemporary audience while retaining Shakespeare's powerful poetry. We are looking forward to what this season brings for entertaining and lively productions.